I go to school in an Indian-food-desert, i.e. central upstate New York. 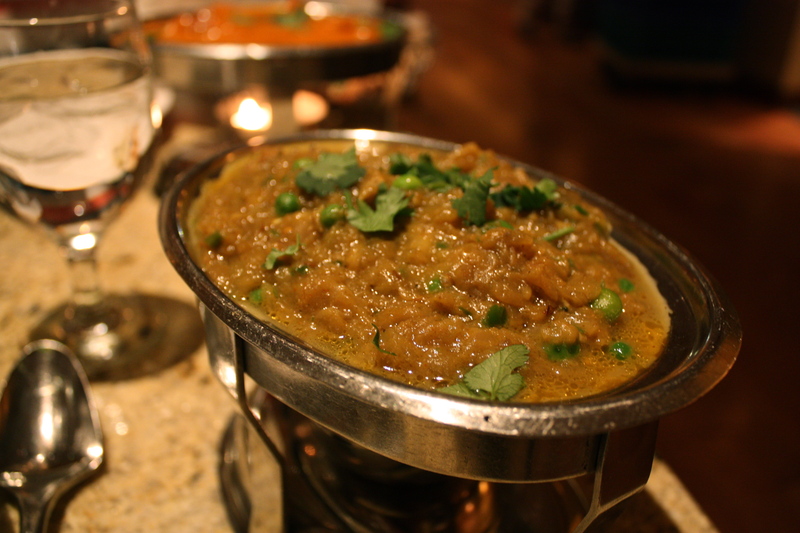 There is a place about thirty minutes away that serves quick, buffet style food, but after growing up near Boston, I’ve been spoiled by eating some delicious Indian meals. And so, when I arrived home one weekend last April, I headed straight for some warm pakoras, hearty baingan bharta, and garlic naan. I savored and devoured the food in a way I’m sure the restaurant had never seen before. I was in heaven, enlightening my taste buds with every bite after being deprived of the deliciousness of Indian food for several months. And this is where I learned a big lesson. Once again, my irrational food impulses took over and I forgot to look at the big picture. After arriving at the restaurant, I realized I had likely made a poor decision about where to eat dinner. I called my dad frantically, asking if I was about to make the worst mistake by eating Indian food before running 26.2 miles in the Boston Marathon. He has run the marathon before, though I’m guessing he did not eat chicken vindaloo before the race. I persevered and remained at the restaurant, straying from spicy foods, though it was impossible to avoid high fatty foods. This was anything but the pasta carbo-loading dinner that I expected to eat. Running literally clears bodies. And yes, it’s exactly how it sounds. Because of the pounding on the pavement, and the intense aerobic activity, running quickly tells you a lot about your body. Runners tend to push through pain, whether it be cramps, knee aches, or bowel movements. Most beginner runners will find that it may take an adjustment to find a diet, and a time to eat, that suits their exercise. As a runner becomes more experienced, typically these stomach issues dissipate. However, it is important to keep in mind (which I did not) that a marathon run takes a considerable toll on a body, regardless of running level. My run went smoothly despite my worrisome, yet overwhelmingly delicious Indian food meal. I’m grateful that I had the rationale to eat this meal two days prior to the race, not one day. Next time, I will likely try to suppress the urge to eat Indian food until after I accomplish the long race. But then again, I’ve had a terrible track record of not listening to my brain and instead listening to my stomach. Maybe I will just open up an Indian restaurant at my school to settle my Indian food wants. Problem solved. Haha, I just ran my first half marathon and had planned to have homemade spaghetti but then ended up having chicken strips, fries and two beers. What can I say? It was game day.